In this Photoshop tutorial, we'll learn how to create a high key glow effect, which is a fancy way of saying we'll be applying a glow only to the highlights in an image. This effect works especially well with wedding portraits since it's great for adding a romantic, magical look to your photos, and wedding portraits usually contain lots of bright white areas to work with. We'll see how to easily select just the highlights in an image using Photoshop's Color Range command, then we'll copy the highlights to their own layer and create the glow effect using a blur filter and one of Photoshop's layer blend modes designed for lightening images. Finally, we'll combine layers into a layer group and use a layer mask to limit the areas where the glow effect is visibile. It may sound like a lot of work, but once you know how to do it, the entire effect can be completed in just a few minutes! I'm using Photoshop CS4 here, but any recent version of Photoshop will work. 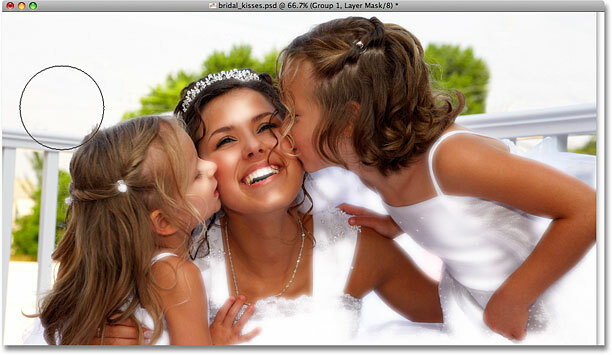 The image after applying the glow effect to the highlights. Choose "Highlights" for the Select option at the top of the Color Range dialog box. Selecting the highlights in an image is easy with the Color Range command. You can also press the keyboard shortcut Ctrl+J (Win) / Command+J (Mac) which is a much faster way to copy a layer. Normally, this would create a copy of the entire layer, but any time we have something on the layer selected, only the area inside the selection is copied. In this case, we have the highlights selected, so only the highlights are copied to the new layer. The new layer ("Layer 1") contains only the highlights from the photo. Use the Layer Visibility icons to temporarily turn layers on and off in the document window. Viewing the contents of "Layer 1". Click once again on the Layer Visibility icon for the Background layer to turn it back on. We'll now use the highlights to create our glow effect! Changing a layer's blend mode affects how the layer blends in with the layer(s) below it. The highlights appear brighter after setting them to the Screen blend mode. 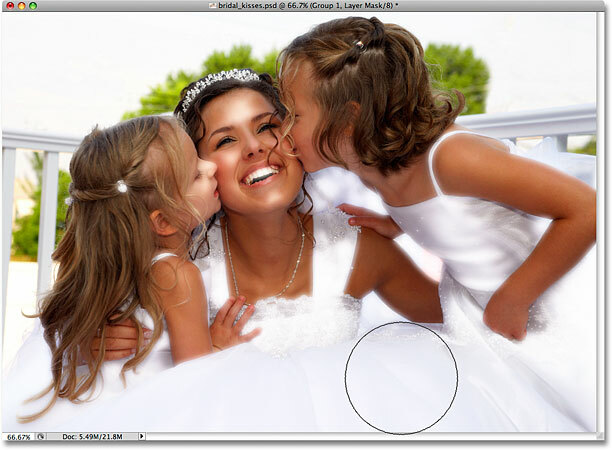 Adjust the amount of blurring with the Radius slider. The harsh edges of the highlights have now been softened into a glow effect. Since no selection was active this time, the entire layer was copied. The glow effect may now be a little too intense in some areas. To control exactly which parts of the image are affected by the glow effect, as well as the intensity of the effect in different areas, we can use a layer mask. Since my document contains two separate layers for the highlights ("Layer 1" and "Layer 1 copy"), I'm going to control both of them at once by combining the two layers into a layer group and then adding a layer mask directly to the group. The ability to select multiple layers at once was first introduced in Photoshop CS2. Click on the triangle icon to twirl a layer group open or closed, revealing or hiding the layers inside it. Adding a mask to a layer group allows us to mask all of the layers inside the group at once. 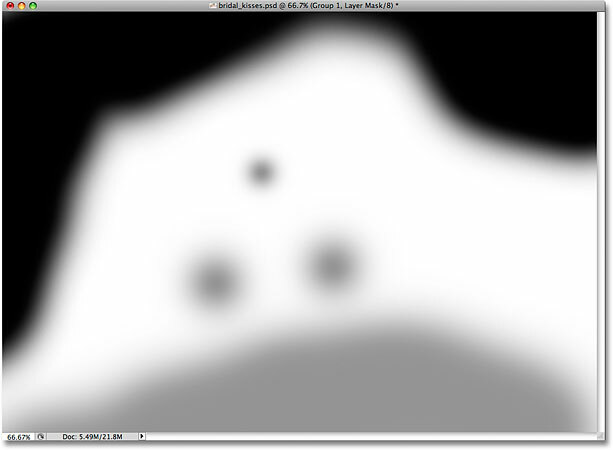 The default Foreground (black) and Background (white) colors are reversed when a layer mask is selected. With the Brush Tool selected and black set as your Foreground color, paint over any areas in the image where you want to hide the glow effect. Since we're painting on the layer mask, not the image itself, you won't see any black appearing as you paint. Instead, you'll see the glow effect disappearing from view in those areas. You can control the size of the brush as you paint using handy keyboard shortcuts. Press the left bracket key ( [ ) to make the brush smaller, or the right bracket key ( ] ) to make it larger. You'll want to use a soft edge brush as you paint, and you can control the hardness of the brush edges by adding the Shift key to the shortcuts I just mentioned. Press Shift+left bracket ( [ ) to make the brush edges softer, or Shift+right bracket ( ] ) to make them harder. Painting with black on a layer mask hides the content of the layer(s) in those areas. 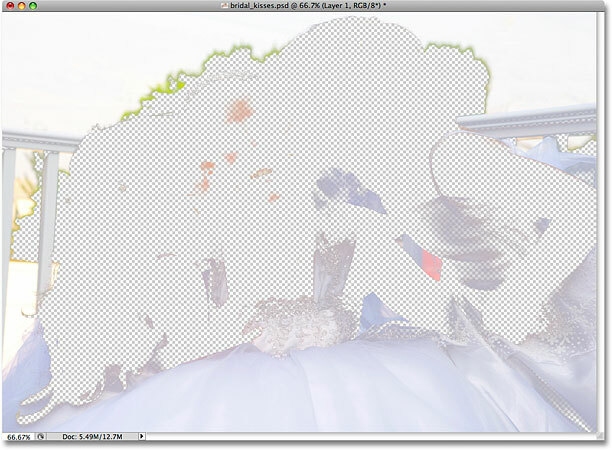 The layer mask thumbnail shows us which areas of the image we've painted over. The Options Bar shows options for whichever tool is currently selected. Here, it displays options for the Brush Tool. Use a lower opacity brush in areas where you want to reduce the intensity of the effect. Hold down Alt (Win) / Option (Mac) and click on the layer mask thumbnail to view the mask inside the document window. The final high key glow effect. And there we have it! That's how to add a high key glow effect to an image with Photoshop! Visit our Photo Effects section for more Photoshop effects tutorials!